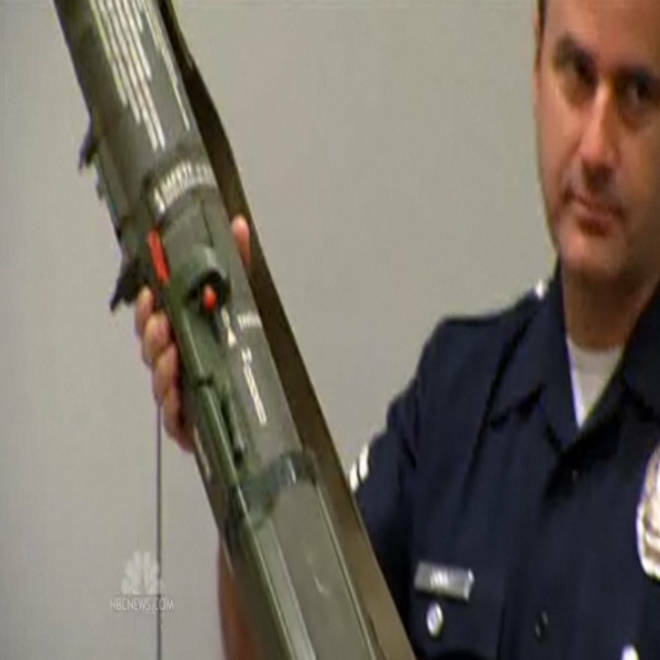 A Los Angeles police officer displays a rocket launcher turned in during a gun buyback effort on Thursday. When Los Angeles police moved up their annual Citywide Gun Buyback program to this week, they collected an arsenal that included 75 assault weapons, 698 rifles, 363 shotguns, 901 handguns and — more surprisingly — two rocket launchers. The weapons, essentially long metal tubes once capable of firing rockets, lacked the projectiles and parts needed to fire them, but even so had no place on the streets, police said. "Those are weapons of war, weapons of death," said LAPD Chief Charlie Beck, according to the Los Angeles Times. "These are not hunting guns. These are not target guns. ... they have no place in our great city." Police said the people who brought in the weapons told police that they came from family members who served in the military and no longer wanted rocket launchers in their homes, the Times reported. LAPD was planning to check with the military to determine the origins of the launchers, police said. As it turns out, these were not the first launchers to turn up at a gun buyback. Last May, when the event was timed for Mother's Day, one of these large firearms surfaced in Los Angeles. This year, the total number of weapons turned in was 400 more than last year, despite the event being moved forward by several months in response to the recent mass shootings at Newtown, Conn., Mayor Antonio Villaraigosa said, speaking on Thursday. Assault weapons and even two rocket launchers were included among the firearms handed over to Los Angeles police. NBC's Natalie Morales reports. Perhaps the greatest testament to the success of the program was "the 166 weapons surrendered by residents in exchange for nothing. They just gave them back." Most people received grocery store gift cards for turning in weapons — up to $200 per firearm, depending on the type. Heading into the New Year celebration, Villaraigosa issued a warning to Angelenos who chose to keep their guns: "Firing a gun in the air is a felony." "Don't fire your guns in celebration. But if you do in the city of Los Angeles, we will go after you. If you do it in the county, the sheriff will go after you." The year in quotes quiz: Test your knowledge!